One of the few bright spots in the long, dark month that is January is the arrival of Boden’s spring/summer collection on the website: an event I’ve been looking forward to ever since the sale started. That happy event has now arrived, and I’m glad to report that it was worth the wait: there are lots of items to covet in the clothes section, but it’s shoes I’m here to talk about today, and I think the stand-out number from the selection currently available is the ‘Ashley’ heel, shown above. In addition to the stripe upper I’ve featured here, these also come in rather more neutral black and tan versions. There’s a lot going on with the colourway above: in addition to those black and white stripes, there’s also the multicoloured beads around the foot and on the straps, and the overall effect may be slightly too chaotic for some tastes. 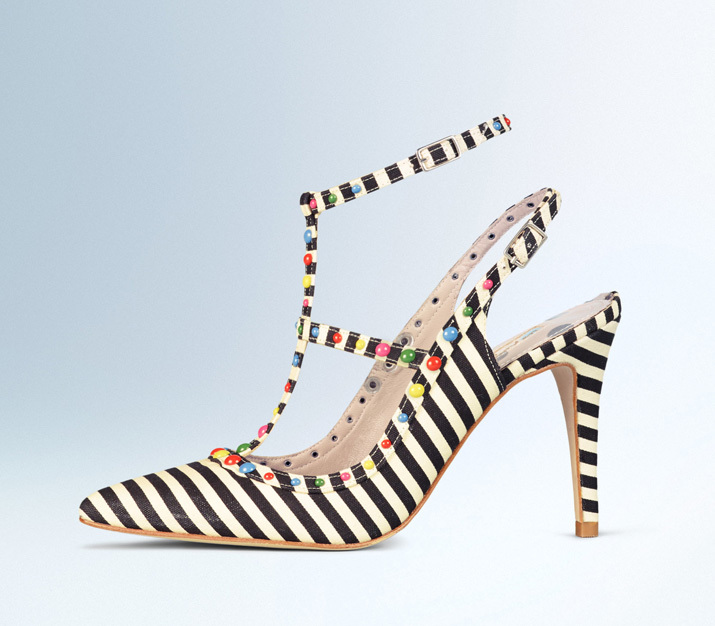 The shape, meanwhile, owes a lot to Valentino’s famous Rockstud pumps, with that distinctive t-bar strap.